Social development is a huge part of growing up. Children learn so much throughout childhood both socially and emotionally that is carried with us into adulthood. Kindergarten helps children prepare for ongoing success in school. It is the place where children learn to work with others, solve problems, communicate with peers and form friendships - all while learning basic skills that will serve as the foundation of their education. It is a BIG year! 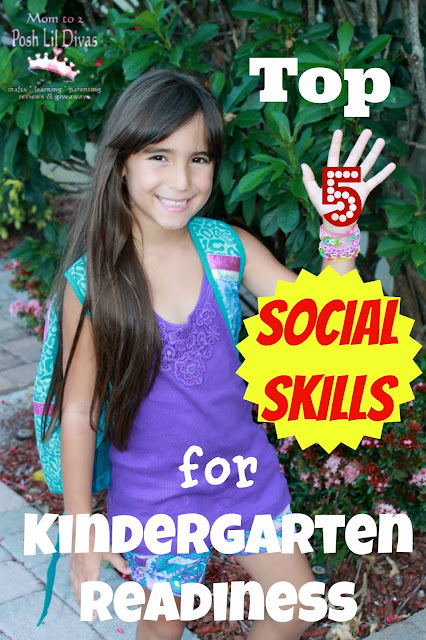 I've taken 5 basic skills that I feel are essential for school success. Getting a head start on them will help your child more readily adjust to their new school, teacher and classmates and hopefully have a successful Kindergarten year - socially and emotionally. Skill #1: Be able to take turns, share and work cooperatively with other children. Kindergarteners will spend a lot of time sharing materials and working in groups or pairs with their classmates. It is essential that they be able to do this without fighting, tears or fuss. Practice - Help your child develop this skill by playing "What Comes Next?". This is a fun game I enjoy playing both in the classroom and at home with the Lil Divas. We start a story and then take turns building it together. For example, I can start the story by saying "Once upon a time there was a little girl". The next person may add "The little girl lived in the forest". The following person might say "One day a dragon knocked on her cottage door" and so on until you reach the end of the story or run out of time. When I play this with the Lil Divas they can go on and on so we sometimes have to just say "to be continued...". There are times where the games does not go smoothly because no one person is in control of the story. You have to be flexible, wait your turn and work together. This is not always easy for children which is why this is a great game to play. Skill #2: Verbally communicate needs and feelings in an appropriate manner. One of the hardest parts of teaching young children in their inability to control their emotions and express themselves. I can not tell you the amount of time taken up by tears and children that are unable to tell me what is wrong so we can handle the situation. In the preschool setting we have more time to deal with these types of issues than they do in a kindergarten classroom. It is essential that children learn to express themselves verbally, assert themselves and treat others with respect. Practice - Discuss feelings and let children freely express themselves on a daily basis. Give your child ample opportunity to practice their communication skills and express their feelings verbally. Ask them lots of questions about their day, what they liked and didn't like, what they would like to do, etc. I can't say it enough - talk, talk, talk! This is especially important if you have a shy child at home. I had a child in my class one year that wouldn't even ask to use the bathroom at the beginning of the year. Your child needs to feel comfortable with expressing themselves and voicing their basic needs. Skill #3: Understand the difference between right and wrong, act accordingly and be aware of the feelings of others. Being able to act in a non-disruptive manner, treat peers with respect and exhibit empathy for others are a huge part of Kindergarten. Practice - Role Playing is a great way to reinforce right and wrong and appropriate behavior. Offer your child pretend scenarios and let them "act out" how they should react. For example, you might invite them to play with puppets or dolls or even dress-up and be the actors yourselves. Then provide scenarios such as - 2 dolls playing happily with a toy and a 3rd doll comes and takes the toy away. Ask - What should the 2 dolls that lost their toy do? Discuss whether the 3rd doll should have taken the toy away and what would have been a better course of action (ask to play, wait turn, etc). Take the opportunity to discuss not just the appropriate behaviors/actions but the feelings involved. Developing a sense of empathy for other children is a crucial part of social development. Skill #4: Follow directions, understand rules and respect authority. This one is huge! Your child must be able to listen to and respect their teacher and follow simple directions in the classroom. Practice - Play games like Simon Says, Mother May I, Follow the Leader and Red Light, Green Light. Children should be made aware of the directions for playing the game and play accordingly. Don't always let them go first or win. As parents we tend to try to make things easy for our little ones but at school they will be faced with not always being first, not being able to act on their every whim/desire or being the winner of a game at recess, etc. It's best to prep them and help them act in an acceptable manner versus acting out when things don't go as planned/desired. Skill #5: Adapt to transitions in a positive manner. A day in Kindergarten is busy. There is so much to do and fit in. Children must be able to move with the flow and make the necessary transitions smoothly. They must be able to line up at the end of recess without the teacher going to seek them out or calling them numerous times. They should be able to move from whole group work to independent work. They should be able to smoothly transition from unpacking in the morning to getting ready to work. This is difficult for many children, especially if they have a very free routine at home or preschool. Practice - Try to have an established routine at home. In the weeks before school starts play "school" and practice how a school day might run. This can be as simple as you like but be sure to incorporate some transitions. Set up a circle time and read a book together followed by a craft time. Once your activity is over have clean-up time. Incorporate snack time followed by an outdoor activity or vice versa. The key is get children comfortable with change and help them adjust to necessary transitions. Kindergarten is a fun time for most children. It involves lots of opportunity for social and emotional development. Understanding the boundaries of the school setting, being able to work cooperatively and being aware of and respecting the feelings of others are important social-emotional skills needed for Kindergarten. Working on these skills before your child starts kindergarten is a great way to prepare your child for the start of school. This post is part 2 of an 8 week series being hosted on 6 blogs to help kids Get Ready for K Through Play! Last week we discussed Developing Kindergarten Language Skills. I agree! From a kindergarten teacher...thank you! Wonderful to include social skills for Kindergarten readiness. Love your list and ideas for preparation! Great ideas! I especially like the role playing ideas and practicing routines. So many kids have such a hard time with the fact that they need to do what the teacher says and have a little bit less choice in kindergarten. It is good to practice at home and also warn kids about it. I'm thinking I'll prep my son by also having him help me plan unstructured and more flexible fun activities after school that can be a bonus for good listening/following direction behavior at school. Kristina - that loss of choice is so hard for children. I find it's essential to give my girls some "free" time when they come home. They really need it after a day at school. If you can, try putting your kids in pre-school classes a few days each week. There are classes for low income families in California such as head start, and what the kids are doing in these classes is often similar to what kids are learning in the first days of kindergarten. Take your kids to the public library story times, which are also another great way for kids to learn how to listen. Take your kids to the park and make friends with other parents. Bring a toy, like a ball, and encourage your child to share it with others. Great Tips Julia! Thanks so much for sharing.